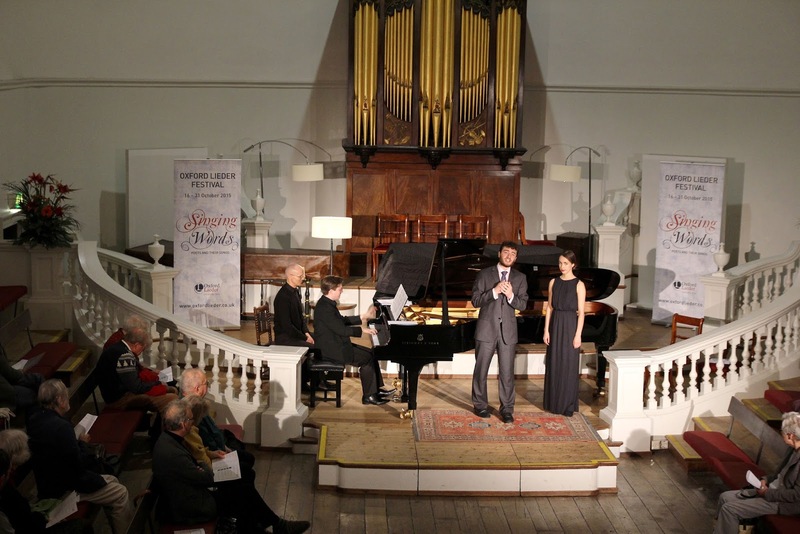 My day at the Oxford Lieder Festival on Friday 30 October 2015 continued with the rush-hour recital at Holywell Music Room with students from the Royal Academy of Music, Olivia Warburton, Michael Mofidian and Jonathan Palmer Lakeland in Brahms. We then returned to the Holywell Music Room for the evening recital was a programme of ballads by Schubert, Schumann and Loewe from Matthew Rose and Joseph Middleton. The day's events concluded with a late night recital, which alas I had to miss; Dreams, a programme of music by Faure, George Crumb, Debussy and Berg from Annelies Can Hiftje, Elisabeth Swedlund, Jennifer Witton, Jessica Dandy and Lana Bode. And you can read about the earlier part of the day with lunchtime and afternoon performance, in part one of my article, also on the blog is my recent interview with Sholto Kynoch, artistic director of the festival. For the rush-hour concert at Holywell Music Room, three Royal Academy of Music students gave a programme of lieder by Brahms. Baritone Michae Mofidian, mezzo-soprano Olivia Warburton and pianist Jonathan Palmer Lakeland performed Brahms lieder in a programme devised by Richard Stokes, Professor of Lieder at the Royal Academy of Music. Richard Stokes introduced the programme commenting that Brahms's texts were largely melancholy, often 'men outside doors not being admitted by women', and he quoted Nietsche's comment about Brahms 'the melancholy of inability'. The two singers generally alternated songs, joining together for a pair of duets. Mezzo-soprano Olivia Warburton had a lovely dark toned, rich voice with a strong neoclassical scultural quality to the line. Whilst Michael Mofidian had a fine lyric baritone voice with dark hints to it and a nice easy top, with a lovely way of communicating vividly with the audience. Warburton started with a delightful performance of Juchhe!, then Mofidian showed his talent for really putting a song over in Sunday. Warburton's Am Sontag Morgen was full of lyric melancholy with a nicely pointed accompaniment from Palmer Lakeland. Mofidian sang Uber die Heide with a fabulous lyric line, and Palmer Lakeland nicely pointed the accompanied. Mofidian gave a strong sense of the underlying emotions. Then he brought deep dark melancholy to Nicht mehr su dir zu gehen with its strong piano postlude. There was more passionate melancholy from Warburton in Ach, wende deisen Blick then the two joined for Da unten im Tale, full of melodic charm but very bitter-sweet. An eine Aolsharfe suited that rather neoclassical cast of Warburton's voice, whilst Mofidian brought deep darkness to the free vocal line of Mit vierzig Jahren. Warburton was dignified but passionate in An die nachtigall whilst Mofidian's dramatic and intense vocal line as complemented by Palmer Lakeland's stormy piano in Verzagen. Warburton combined a sculpted line with lyric rapture in Der Tod, das is die Kuhle nacht. Mofidian was full of characterful swagger in Unuberwindlich and again we could admire how he put a song over and really communicated with the audience. Kein Haus, Keine Heimat was dramatic and striking, and very short. The final duet, Vergebliches Stanchen was a characterful delight, and then Warburton closed things with a poised account of Wiegenlied. After a delightfully sociable supper at the Vaults Restaurant, we returned to the Holywell Music Room for the evening recital from bass Matthew Rose and pianist Joseph Middleton. Their programme was centred around ballads, with long dramatic pieces from Schubert, Schumann, Loewe and Wolf as well as Brahms's Funf Lieder. It was a dark, dramatic, often melancholy programme and at the start of the second half, before Carl Loewe's Tom der Rhymer, Matthew Rose informed us that we were allowed one happy song this evening, and that this was it. The programme began and ended with Goethe's philosophical poem about man's place in the universe Grenzen der Menschheit (Man's limitations), opening with Schubert's setting and closing with Wolf's. Schubert's setting started with a strikingly dramatic piano intro, and then the performers created a dark, almost operatic arioso. Matthew Rose's mesmerising performance combined words and drama with the music, and the conclusion captured the magisterial bleakness of the song. Rose and Middleton followed this with a a pair of shorter Schubert songs. The thougthful opening of Auf der Donau again dealt with man's place in the universe, with Rose and Middleton creating vivid drama in the middle section. Fahrt zum Hades was philosophical rather than vividly dramatic, creating something questioning and unsettling. Schumann's Die beiden Grenadiere is a setting of Heine's poem about two returning French veterans, returning to find the Emperor has been defeated. Matthew Rose gave us a strongly vigorous narrative with very vivid storytelling. In the final section, Schumann' beautifully undermines the glorious Marseilleise-based martial conclusion with a quietly questioning postlude. Brahms's Funf Lieder Op. 94 were published in 1884 and it is one of Brahms's groups which is more than just a set, and some of his contemporaries viewed the songs as a cycle. Most of the songs are not easy, and display a sense of unease and questioning. Matthew Rose and Joseph Middleton gave a richly subtle performance, and we could admire the varied colours of blackness in Rose's voice. Mit verizig Jahren had a great sense of character and world-weariness, with a sense of unease amidst the comfortableness. Steig auf, geliebter Schatten was powerful and questing, yet sober. Mein Herz is schwer build up quite a head of steam and again was not comfortable. Sapphische Ode by contrast was full of simple beauty, whilst the short Kein Haus, keine Heimat was a short, dark drama with an edgy piano accompaniment. Having heard some of the songs earlier in the evening, I was struck by how much they gained by being performed in a group. 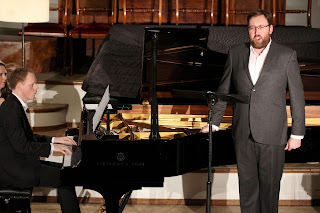 After the interval Matthew Rose and Joseph Middleton started with three of Carl Loewe's great ballads. Tom der reimer, setting a translation of a Scottish ballad, is perhaps the best known (I can remember first hearing it in the 1970's sung by Cathy Berberian). Loewe keeps the vocal line relatively straightforward and plain, but surrounds it with a great deal of comment and description from the piano, starting with a lovely rippling prelude. Rose delivered the song with superb attention to the narrative and to the text, whilst he and Middleton kept a sense of forward momentum with Middleton contributing some delightful piano moments such as the bird singing in the ash tree. This formula continued with the far more dramatic Edward, also based on a Scottish ballad about a man who has killed his father. Rose really brought out the sense of the two characters, Edward and his mother and the vividly intense narrative was punctuated by a pair of superb explosions, the moment when we learn Edward has killed is father and the culminating moment when we find out it is his mother who told him to do it! The final Loewe ballad was another Scots one, Archibald Douglas with a narrative about Archibald Douglas attempting (and succeeding) in reconciling with James, King of Scots. I have to confess that in this ballad, despite sterling work from Rose and Middleton, I did feel that the song rather outstayed its welcome at 23 verses. Finally a group of Hugo Wolf songs. Wolf's Drei Gedichte von Michelangelo, setting Michelangelo poems in German translation, were among the last pieces which Wolf wrote before going into the mental asylum. Three darkly intense pieces, the opening song introduced us to different, more complex world very different from earlier Wolf. Deeply philosphical, the first song built to a powerful and suprisingly positive climax. The second was quiet, intense and bleak with chromatic harmonies which pushed to the limit of tonality. This sense of the extremes of harmony continued in the final song where the performers brought out the complexity of Wolf's response to the text, with traces of romantic song overlaid by intense chromatic harmony. The final item in the programme returned us to Goethe's poem Grenzen der menschheit. Starting with strong chords and a steadily unfolding line, the music was strongly powerful leading to the eerie, otherworldl final verse and a highly intense postlude. The performance, from Matthew Rose and Joseph Middleton really brought out the metaphysical aspects of the piece, resulting in a real, very unshowy, tour de force. Throughout the programme Matthew Rose's voice brought a dark seriousness to the music, complementing the often sense of philsophical melancholy in the poems. Throughout he was complemented by the seriousness of Joseph Middleton's piano playing.The programme displayed a variety of responses from composers to the long ballads, and Rose and Middleton brought out the distinctive qualities of each. Overall, I did wonder about the slight sense of unrelieved gloom in the programme, and whilst the Brahms songs were extremely fine, I did wonder whether something a little less dark might have given some necessary contrast. The dramatic ballads of Carl Loewe were perhaps the most approachable, but the more metaphysical aspects of the Wolf songs were highly striking and a throughtful way to end the programme. You can read about the earlier part of the day with lunchtime and afternoon performance, in part one of my article, also on the blog is my recent interview with Sholto Kynoch, artistic director of the festival.